A basketball hoop currently stands at the end of Miller Drive in Sunbury. Plans are to extend the drive and construct the entrance to a high school and elementary school for Big Walnut Local Schools. Pictured is the future site of the new Big Walnut High School and Big Walnut Elementary. The recently purchased land is located east of Carters Corner Road, west of state Route 61, and north of U.S. Route 36/state Route 37 in Sunbury. 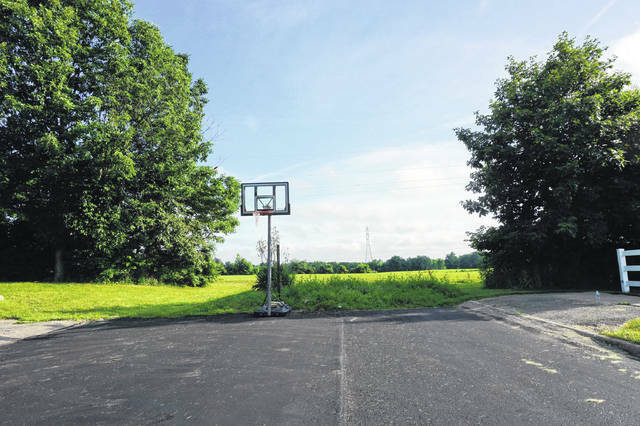 Four people complained about Miller Drive being used by the Big Walnut Local School District during the public comment portion of the Sunbury Village Council meeting on July 18. “We want to know what your concerns are,” said Mayor Tommy Hatfield. “That road is stubbed — it’s going to go somewhere.” He said that land could have been developed in another way, such as hundreds of homes, which would also increase travel on Miller Drive. Hatfield went on to say that he lived along a road near a school, and while there were times it was inconvenient, it was outweighed by the positives. 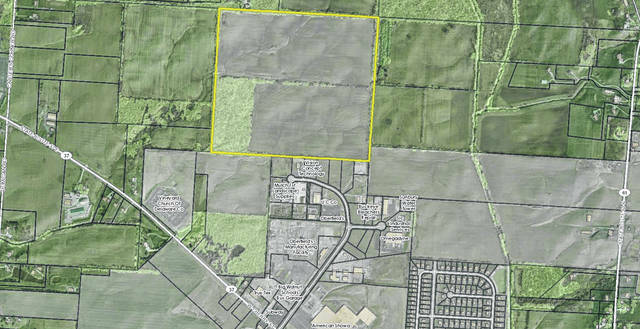 In June, the school district ratified a contract to buy 97 acres of land within the village of Sunbury in order to build the schools on the same farm land. “The purchase price includes the access easement and utility easement” of two other parcels of land with the intent of extending Miller Drive and constructing a driveway for the school, the contract states. This extension would be similar to Big Walnut Middle School. The property doesn’t have a street address, but it is at the northern edge of Sunbury, roughly between the Vineyard Church of Delaware County and the Sunbury Water Tower (located north of both). It is also just above Vision Concept Technology, 690 Kintner Parkway. Kintner could be a potential secondary access for bus traffic since the bus garage is on the parkway. However, that would involve another acquisition. One of the speakers wondered why the schools were going to be behind an industrial park and weren’t going to be along a prominent road. BOE President Andy Wecker said the district wanted a property that was within the growing village. Director of Facilities Doug Swartz and Wecker said the elementary school would be built first. Swartz said community input would be sought for what belongs at the schools. The residents were told that the school district would have to come to the village with proposed development plans that would need to go before zoning first and then to council for approval. The village council has a three-reading process for legislation. The district doesn’t appear on the agenda for the zoning meeting on July 23, and it’s not currently on the agenda for the August zoning meeting. Solicitor David Brehm said there would likely be multiple public hearings regarding the schools.